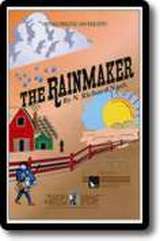 The Rainmaker is produced by special arrangement with Samuel French, Inc.
At the time of a paralyzing drought in the West we discover a girl whose father and two brothers are worried as much about her potential future as an old maid as they are about their dying cattle. For the truth is, she is indeed a plain girl. The brothers try every possible scheme to marry her off, but without success. Nor is there any sign of relief from the dry heat, when suddenly from out of nowhere appears a picaresque, sweet-talking man with quite the sales pitch. Claiming to be a "rainmaker," the man promises to bring rain, for $100. It's a silly idea, but the rainmaker is so refreshing and persistent that the family finally consents, banging on big brass drums to rattle the sky. Meanwhile the rainmaker also turns his magic on the girl, and persuades her that she has a very real beauty of her own. She believes it, just as her father believes the fellow can actually bring rain. Rain does come, and so does love.